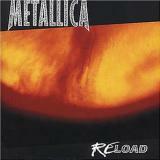 Reload – the other side of Metallica’s mid-90s experiment. Before going into the record itself, I’d like to make a really quick rundown through my personal history with Metallica. Their self-titled album was the first record I bought myself. I was about ten back then, in 1995. Soon after I got the band’s earlier records and thus received my first taste of the thrash and speed varieties of metal. So you can imagine how perplexed I was a year and two later when the new Metallica-albums came out, sounding completely different from what they were thrashing about on the discs I already had. Reload is pretty much a second disc that completes a double CD-set of Load. The songs for both albums were mainly written within the same sessions and I think the band has said that one could pretty much change the places of songs between the two albums and they would still end up with a well-representing track listing of those times. The sound of the band continues to flirt with the straight-forward, groove-heavy rock-vibes that were very much prevalent on Load. Blues, country and southern rock can be heard ever so often throughout the record. The band plays very tightly and those who thought that James Hetfield’s vocals didn’t really reach full potential until the Black album, will probably like his work on this one as well. He sounds very confident and versatile throughout. The stellar production backs up the band very well. The main problem to me with Reload today is that the song material is very uneven. It has a few high-energy rockers in Slither and Fuel (which still is understandably a frequent live choice from this record that the band plays) which possess a fabulous groove that sends fists pumping in a big way. The single The Memory Remains is otherwise a good epic rumbler, but the guest female chants by Marianne Faithfull are quite cringe-inducing. The experimentation bares much better results with Low Man’s Lyric, a very melancholic ballad that receives a folky atmosphere via the use of violin and hurdy gurdy. I must also bring forth the most controversial of stances: I like The Unforgiven II, even though I don’t understand it fully myself either. The guitar melodies are blatantly countryish and I hate country by and large, but it works. The call back-lyrics referring to “part one” is a pretty cheesy concept, but it works. The chorus is damn catchy and there is a weird, brooding pulse in the whole song that gets my hair moving. I know, God, most of my friends who are into rock in any way and dig Metallica think this song is one of the worst they’ve ever made, but I like it. Reload has a lot worse material on it. Songs like Better Than You, Attitude and Fixxxer are pretty boring mid-tempo chuggers that just don’t take off at any point. It doesn't help that many of the tunes are two-three minutes too long. I’d say an overall increase in tempos and skimming the excess from some songs would have done this record good. Overall, Reload offers a hefty, well, load of the same that Load provided, as the circumstances easily let us deduct. As a complete package, Reload has a lot more filler than Load. I’d dare say that the few tunes that are great on this record are better than anything on Load, but as a total package, Reload falls by the wayside. All the technical aspects from production to mixing are top notch, but the song material fluctuates way too much in quality. If Load delighted your senses, Reload might have lots for you to love, but if the first half of this set didn’t convince you, the second one won't stand much of a chance. A brave release from the biggest metal band in the world, but one that doesn’t frequent my stereo system.